Kaiser Local 5 members on strike. Kaiser Permanente's Local 5 workers have begun a 6-day statewide workers strike. Hawaii Independent. Workers at Hawaii’s largest health care organization started a six-day strike early Monday, union spokeswoman Paola Rodelas said. Associated Press. Members of the Local Union 5 began their six-day strike after labor disputes with health care giant Kaiser. KITV4. Kaiser Permanente Local 5 workers on three islands are walking the picket lines as part of a six-day strike. The 1,900 workers include Kaiser receptionists, medical assistants and certified nurses aides. KHON2. Six of Hawaii's seven House Republicans gathered Monday to introduce their latest caucus legislative package, a collection of bills touted as ways to encourage business across the islands, provide tax relief and better scrutinize the state's energy regulators. Star-Advertiser. The seven Republican representatives in the 51-member state House will be pushing 20 bills this legislative session as part of their Minority Caucus package. The bills generally fall under three categories: creating jobs, lowering the cost of living and giving the government back to the people, Minority Leader Beth Fukumoto Chang said during a press conference Monday at the Capitol. Civil Beat. Nearly 2,900 bills were introduced in the first week of Hawaii’s 2015 Legislative session. Associated Press. A bill introduced in the Hawaii state Legislature would task the state Department of Commerce and Consumer Affairs with licensing vacation rentals in the Islands. House Bill 825, introduced by Scott Saiki, D-McCully-Downtown, gives authority to the DCCA director to license transient vacation rental owners, as well as fine and investigate the actions of any vacation rental owner without a license. Pacific Business News. Hundreds of people have asked the state to give them millions of dollars over the past year to cover claims such as potholes damaging cars, students suffering from food poisoning, prison guards assaulting inmates and public employees sexually harassing co-workers. But unlike larger claims that first go through the Attorney General’s Office and then to the Legislature where final approval is given during public hearings, claims settled for smaller amounts are quietly handled within the Department of Accounting and General Services. Civil Beat. Senate bill would boost our food security. SB593 would require the Agribusiness Development Corporation to lease 50 percent of its land to local food production. Hawaii Independent. Bill seeks to stop discrimination against Section 8 tenants. Associated Press. A bill allowing schools to accept in-kind services in lieu of rent for use of their facilities was supported by Oahu pastors but opposed by the state Department of Education during a state Senate Education Committee hearing Monday afternoon. Civil Beat. The Hawaii Health Information Exchange and Hawaii Health Systems Corp. have signed a data sharing agreement to make patient medical records available electronically to community health care providers and hospitals across the state. Pacific Business News. Hawaii’s state run hospital system appears to be in dire financial straits. However, it does have new leadership in its CEO, Dr. Linda Rosen, who as Pacific Business News reports, has a lot of experience dealing with emergencies. Hawaii Public Radio. Mercury levels in yellowfin tuna caught in the Pacific Ocean near the Hawaiian Islands have been rising at a 3.8 percent annual rate since 1998, according to a new study.Star-Advertiser. Halfway into his first term, Honolulu Mayor Kirk Caldwell retains job performance approval from more than 2 out of 3 registered voters. Star-Advertiser. From paving pot holes to showing his support for bicycling commuters and picking-up trash, Honolulu Mayor Kirk Caldwell appears to be everywhere, and that face time with the community has translated into a favorability rating of 64% -- according to our Hawai'i News Now - Star Advertiser poll. State Sen. Brickwood Galuteria admitted Monday that he has improperly claimed a rental property in Palolo as his primary residence and will likely have to pay back taxes on the nearly $1.8 million home. Civil Beat. A University of Hawaii task force charged with reviewing operations at the financially struggling UH Cancer Center says a "flawed and incomplete" business model is preventing the center from achieving its mission to reduce the burden of cancer through research and education. Star-Advertiser. A report critical of the University of Hawaii Cancer Center is leading to a call at the State Legislature to either sell or lease the research facility. KHON2. An overwhelming majority of Oahu residents has no intention of using bike lanes, but they sure like the idea of getting someone else to use bicycles to commute — especially along Hono­­lulu's new King Street "Cycle Track." Star-Advertiser. As local lawmakers struggle to find solutions to Hawaii's housing crunch, a local charity is demonstrating what out-of-the-box thinking could look like. Faith Action for Community Equity, or FACE, has set up a 20-foot-by-8-foot shipping container on the grounds of Honolulu Hale that can house a family of five. KITV4. The Honolulu Seawater Air Conditioning project, which expects to start construction this fall on the system to cool Downtown Honolulu office buildings and condominium towers with cold water from the ocean, may be expanding to cool the scores of high-rise condos being built nearby in the growing Honolulu neighborhood of Kakaako, the project's CEO told Pacific Business News. A 42,000-gallon jet fuel spill reported Jan. 21 is likely due to a weld failure on the bottom of an above-ground storage tank at a Sand Island tank farm, which supplies fuel to Hono­lulu Airport, the tank operating company said. Star-Advertiser. The U.S. Coast Guard plans to honor a Honolulu-based cutter's 45 years of service during a decommissioning ceremony. The Honolulu-based Cutter Rush is being replaced by the Cutter Sherman. Star-Advertiser. Attorneys representing groups suing Hawaii County over its restrictions on genetically modified crops want the county to defend itself without help from national advocacy groups such as Earthjustice and the Center for Food Safety. West Hawaii Today. 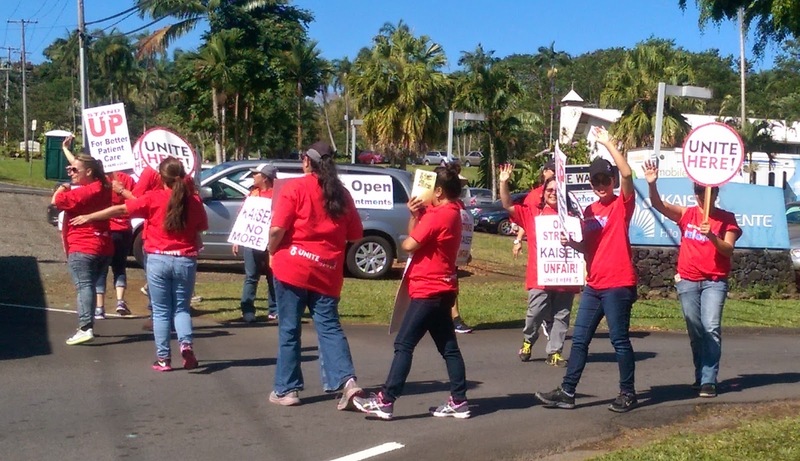 About 20 Kaiser Permanente employees marched Monday morning in front of the Hilo clinic as their labor union kicked off a six-day strike.Tribune-Herald. Gov. David Ige released Monday $4 million in general obligation bond funds appropriated by the Legislature to finance construction of various improvements to the Waimea District Regional Park. West Hawaii Today. Hawaii County Department of Environmental Management will begin charging a new tipping fee on March 1 to businesses that deposit green waste at recycling facilities in Puuanahulu and Hilo. Revenue from the new fee will help finance an expansion of green waste recycling services across the island.West Hawaii Today. Hawaii County’s police and fire departments intend to maintain comparable coverage in lower Puna if the June 27 lava flow forces them to abandon their main posts on Highway 130. Both share a joint campus on the makai side of the highway outside Pahoa that remains about 0.36 miles from the flow’s stalled tip. Tribune-Herald. The county Department of Environmental Management ended its 2-year-old curbside recycling pilot program Sunday, despite calls from South Maui residents to keep its "3 Can Plan." Maui News. Kaiser Permanente workers on Maui took to the streets Monday as part of a statewide, six-day strike against the health care provider that is stuck in a labor contract dispute. Maui News. Construction is underway in Kihei on what's believed to be Hawaii's first home built with hemp fiber insulation, according to those involved in the project. Maui News. Are the pesticides being used by Kauai’s biotech seed industry impacting the health and environment of the island and its residents? And if so, how? Those are the main questions nine Kauai residents have been tasked with answering over the next year as members of a newly formed Joint Fact-Finding Group. Garden Island. A former Kauai state senator and her siblings are defendants in a trust fraud case filed by their mother in 5th Circuit Court. Evelyn Ohai Fernandes, 87, individually and as trustee of William Ernest Fernandes and Evelyn Ohai Fernandes Revocable Living Trust, is suing four of her children and grandchildren regarding five properties near old Kapaa town that were transferred into a trust. Garden Island. Hawaii’s rainy season has been lacking something it usually has plenty of: Rain. Garden Island.